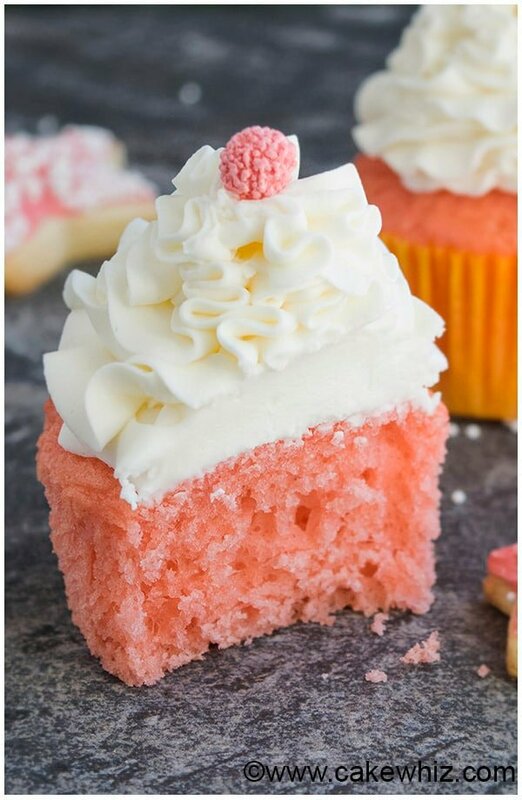 Quick, easy pink champagne cupcakes recipe with champagne buttercream frosting. Soft, moist, fluffy! Great for New Year’s party or Valentine’s Day. 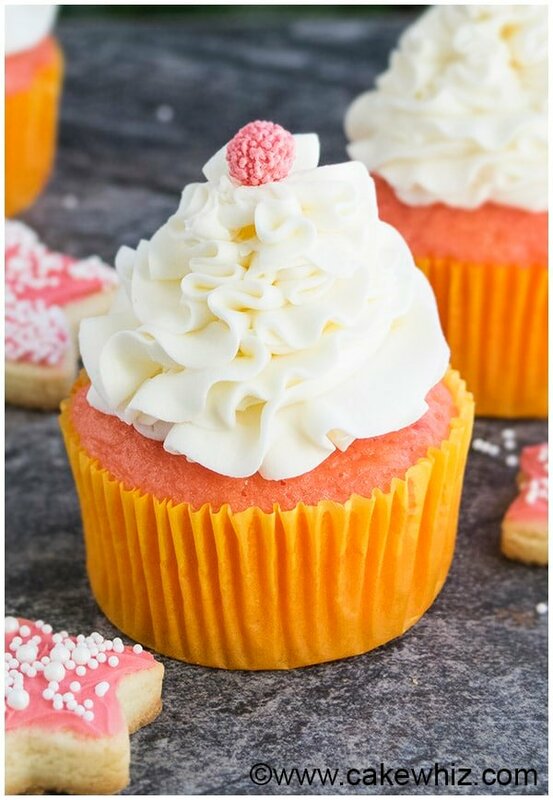 The new year will be here soon and I will be serving these champagne cupcakes with champagne frosting, along with my Champagne Cookies and New Year Cookies at our New Year’s party. This is a doctored cake mix recipe that’s made with simple ingredients and is ready in about 30 minutes. These are the best champagne cupcakes! How to make champagne cupcakes from scratch? How to make champagne cupcakes with cake mix? I have not had much success with a scratch recipe but I have not given up and I am still working on it. In the meantime, I have been enjoying these cupcakes that start off a white cake mix box. Honestly, they taste better than any recipe I have made from scratch. In a mixing bowl, mix together butter, egg whites and extract. Add cake mix, champagne and pink gel coloring and mix until smooth. Top off each cupcake with swirl of frosting. Decorate with sprinkles and enjoy. They are soft, airy, very moist and have a subtle fruity flavor. That fluffy champagne frosting really takes these cupcakes over the top! Instead of champagne frosting, use this White Chocolate Buttercream Frosting. Instead of champagne frosting, use this Strawberry Buttercream Frosting. You can either use a raspberry frosting or fill each cupcake with raspberry jam/jelly/preserves. Use a combination of vanilla and champagne extracts. You can make these cupcakes with any filling you like such as jams and preserves. My favorites is raspberry and strawberry preserves. There are so many varieties of champagnes to choose from. I recommend using Rose champagne. A fancy way of presenting these cupcakes is in champagne glasses. It’s fun and exciting at parties! Also, depending on the size of your glasses, you may have to make mini cupcakes in champagne glasses. You can use any brand of box white cake mix you like. Don’t replace butter with oil since butter makes these cupcakes rich and flavorful. Only egg whites are required in this recipe. Do not use whole eggs. Don’t over-mix the batter or else your cupcakes will be tough. Mix until everything is just combined. Are champagne cupcakes alcoholic? They don’t have to be alcoholic. You can use alcoholic or non-alcoholic champagne in this recipe as well. Also, you can use any brand of champagne you like. The ones you are seeing today are champagne cupcakes without alcohol. All ingredients should be at room temperature so they blend together evenly and smoothly. 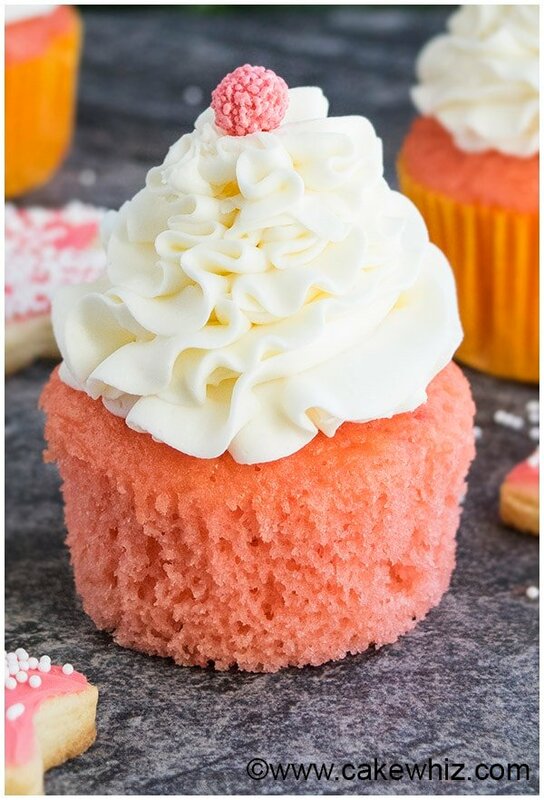 I highly recommend adding a little bit of champagne extract in the cupcake and frosting since it adds a wonderful flavor and fragrance. You can find them online on Amazon. These are the two brands I have used: Lorann Oils and Wilton’s Treatology system. Both are excellent. 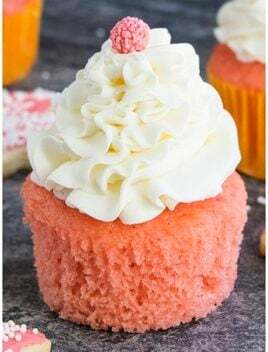 Quick, easy pink champagne cupcakes recipe with champagne buttercream frosting. Soft, moist, fluffy! Great for New Year's party or Valentine's Day. In a mixing bowl, add butter, egg whites, extract and mix until smooth. Mix in cake mix, alternating with champagne until batter is just combined. Pour batter into cupcake liners and bake at 350 degrees for about 20 minutes or until an inserted toothpick comes out clean. Allow the cupcakes to cool down for 5 minutes. Then, remove them from the cupcake tray and place them on a cooling rack. When the cupcakes have cooled down completely, attach Tip # 1M to a piping bag and fill it with frosting. Pipe swirls on top of all the cupcakes and top them off with a small pink candy ball. Enjoy! Store frosted cupcakes in a sealed container in the fridge for up to 3 days. I made this as a cake. I used 2 – 8″ rounds and it turned out great. Also, I used whole eggs and it seemed to work fine. Easy and fun recipe! thank you! Thanks for sharing that feedback Stephanie and happy to hear you liked it!